It’s always lovely to go out for Valentines Day…to be waited on, wined and dined, to be treated like a King and Queen…but for years, we have chosen to stay home. We are home bodies and love it. As you already know by now that I love to cook…Surprise! So, I like to make an extra special elegant dinner for this day. I like to go all out…starting with a grand appetizer such as Oysters Rockefeller, oysters on a half shell with a mignonette sauce, Escargot in a Cognac Cream Sauce, prosciutto wrapped sea scallops with fontina and a raspberry glaze or a simple shrimp cocktail (my grocery seafood department offers steamed shrimp that is just delicious). Add smooth jazz music, candles, nice wine, champagne or kir royale. Done! I just love doing this…it’s very special day and it means a lot to me. For our entree, individual Beef Wellingtons have been our Valentines tradition for many years. It is a beautiful and classic beef dish that just screams decadence and elegance. It may sound difficult and time consuming, but it is not. Once you make it, you will realize how easy it is to make. Plus, you can prepare it and keep it in the refrigerator for a few hours up to 2 days until you are ready to bake it. Yay! So, if you chose to stay home like we do…make a Valentines Day Dinner for two, for your family or friends or just for yourself. 8 oz remini/portobello, button or shiitake mushrooms. 1	The puff pastry box contains folded 2 sheets. I use 1 sheet for 2 filet steaks. You may need the second sheet if the filets are quite large. Thaw 1 puff pastry sheet at room temperature for 20-30 minutes or until pliable yet still cool. *if not using immediately after thawing, refrigerate, well covered with plastic wrap. If it gets too warm, it will stick when unfolding and trust me, you don’t want that. Yep, been there, done that! 1	Trim any excess fat or silver skin from the meat. *You can reshape the filets rounder if you wish by tying them with butchers twine so that it holds its shape as you sear it in the skillet. Tie with twine if the filets are not a solid piece. 2	Pat dry the filets and season each side with salt and black pepper. 3	Heat a large skillet over medium-high heat and lightly drizzle with olive oil. You want the skillet really hot to sear the filets properly. 4	When the oil begins to smoke, add the filets to the skillet and sear for 30-40 seconds on each side. You want a brown color not gray. Remove the filets from the skillet and place on a plate in refrigerator to cool as you prepare the Mushroom Duxelles. *Cut off butchers twine when filets are cooled. 1	Add mushrooms and shallot to a food processor and chop as fine possible. The texture should be similar to coarse breadcrumbs. 2	Heat a medium-sized pan over medium heat and add 1 tablespoon of butter to the pan. 3	Add mushrooms and thyme leaves, sauté until mixture is softened and the liquid has evaporated, about 8-10 minutes. Add cream, salt and pepper. Reduce again over moderate heat to a thick paste and all the liquid has evaporated. About 2-3 minutes. Add a dash of Soy Sauce. Again, you want a thick paste, if there is any liquid it will make the Wellingtons soggy. 4 Remove from heat. Transfer to a plate and refrigerate to cool. Wrapping the Beef and Filling in Prosciutto - (Repeat for each filet). 1	On your countertop, place down a large piece of plastic wrap and place 3 slices of prosciutto, slightly lapping each piece like roof shingles. Spread on half of the mushroom duxelle. If using spinach, apply a light layer. Leave about a 1/2” border along the prosciutto edges. 2	Place one seared and cooled filet in the center of the prepared prosciutto. *If using Bleu cheese, Boursin or liver pate, spoon half of it on top of the filet, then place on top of the prosciutto. 3 Use the plastic wrap to draw up the prosciutto around the fillet, covering all sides. Roll up and twist the ends of the plastic wrap to tighten and to create a filet package. Repeat steps with the remaining filet. Chill for at least 30 minutes or overnight for it to set. 4 In a small bowl, mix egg yolk and one tablespoon water to create an egg wash.
1 Place a large piece of plastic wrap on a cutting board. Unfold the one puff pastry sheet that is thawed, yet still cool. Cut the pastry in half and use a rolling pin roll to smooth out any creases and so that it will extend a couple inches beyond either end of the each filet. Lightly dust the pastry surface with flour so it will not stick to your rolling pin. 2 Remove the plastic wrap from the two filet packages. 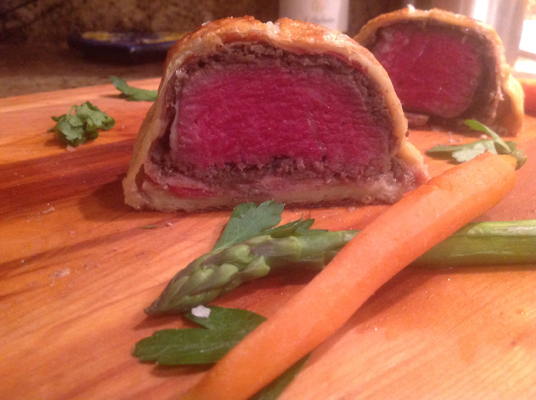 Place a filet package in the center of each pastry half. Lightly brush the pastry edges with water. 3 You will be rolling and wrapping it up like a present, gently stretching the dough if needed. Start by folding in the sides, then folding down the top flap before using a sharp knife to trim off the bottom flap. After repeating on both sides, flip it over and tuck the flaps over, pressing them down so they seal well. Cut off any access pastry and save. To decorate: Roll out the access pastry and cut into shapes to place on top of the Wellingtons. Top with pastry decorations if using. Repeat for other filet. 4 Wrap each in plastic wrap and place them seam side down in the refrigerator for its final firming up and chilling before baking. Store in the refrigerator fridge at this stage for at least 30 mins up to 2 days. 1. Line a baking sheet with foil or parchment paper. Take the Wellingtons out of the refrigerator and remove the plastic wrap. Place the Wellingtons seam-side down on the prepared baking sheet. Brush lightly the top and sides with the egg wash. If desired, decorate with shapes made from the left over puff pastry or use a paring knife knife to lightly score a decorative pattern in the pastry top, making sure not to cut into the meat. Sprinkle liberally with kosher or sea salt on top of each. 2. Bake at 425 degrees for about 20-45 minutes in the center position in the oven until pastry is golden brown and center of filets register 110°F for rare or 120°F for medium-rare on an instant-read thermometer. Remove from oven and allow to rest for ten minutes. To plate, leave whole or cut the Wellingtons in half. *If a Maderia or Bernaise sauce is desired, make the sauce while the meat is baking. When serving, spoon sauce around each Wellington and pass remainder at the table. Drain blender and dry well. Combine egg yolks, lemon juice, and 1 tablespoon water in warm, dry blender. Purée mixture until smooth. Remove lid insert. With blender running, slowly pour in hot butter in a thin stream of droplets, discarding milk solids at bottom of measuring cup. Continue blending until a smooth, creamy sauce forms, 2-3 minutes. Pour sauce into a medium bowl. Stir in shallot reduction and tarragon and season to taste with salt, pepper, and more lemon juice, if desired. 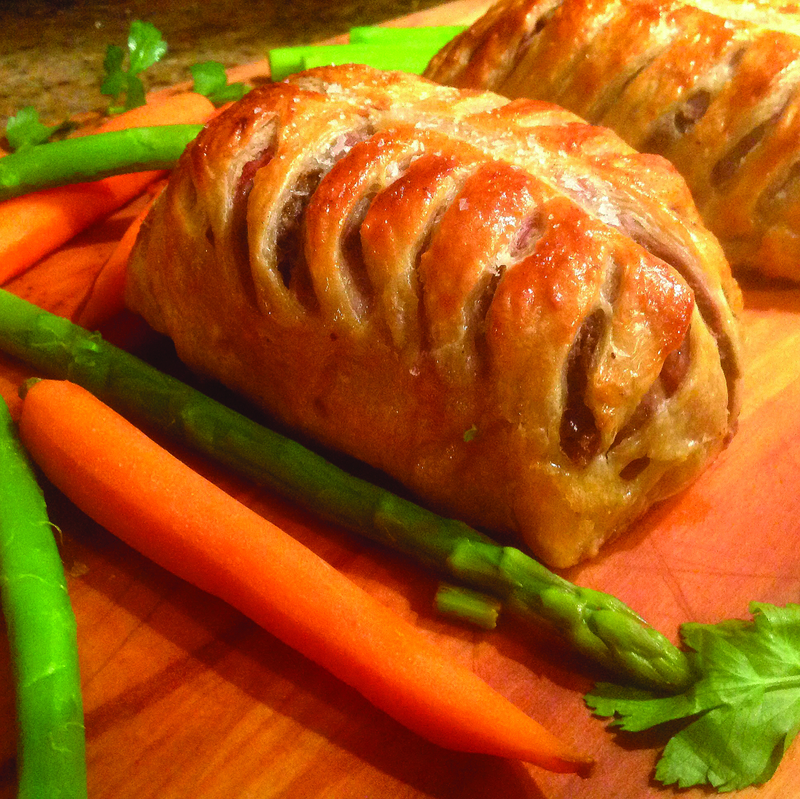 Spoon around each baked Wellington. *The sauce can be made 20 mins ahead. Cover and let stand at room temperature. It can not be cooked and reheated, it will separate.